On the first day of August, hot winds whipped across the foothills east of Oregon’s Mount Hood. The South Valley Fire, which started around 1:30 p.m., exploded to hundreds of acres in a few hours and thousands by nightfall. Pine trees lit up like torches. Sagebrush exploded in towers of flame dozens of feet high. Wind pushed the flames through dry wheat and pastureland in a long cresting wave. As the fire bore down on houses, shops and ranches, locals scrambled to the scene. Some brought plows and tractors to bury dry vegetation and create firebreaks in front of buildings, or carried hoses and water to douse the flames. Others loaded up animals in trailers to save them as the fire crept closer. Dustin Miller heard about the fire less than 20 minutes after it broke out. He left his job as a local agricultural consultant, filled up a tank of water the size of a couple large ice chests that was mounted in his pickup bed, and raced toward the flames. Miller, a 27-year-old lifelong Dufur resident who’s worked on farms and ranches ever since he could dig a trench, joined a fire line at one of the first ranches that burned and then, as it swept towards his home, retreated there. 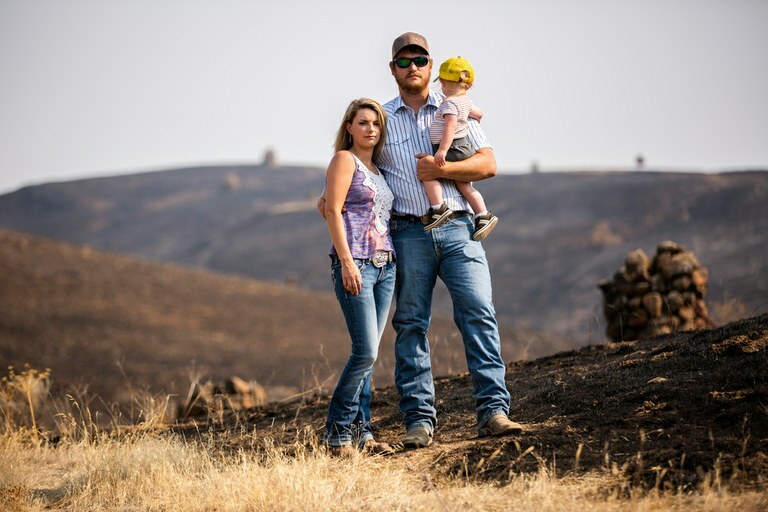 Dustin Miller poses for a portrait with his wife, Dana, and son, Carson, in terrain burned by the South Valley Fire just above their home on the outskirts of Dufur. Miller, who heard about the fire less than 20 minutes after it broke out, left work and was on the fireline shortly thereafter. At Miller’s home, his landlord, Mike Filbin, was on a bulldozer, crushing sagebrush and scrub oak and burying dry grass to make a fire line around the barns and houses. Miller stood on the freshly plowed fire line, along with dozens of other locals, as a wall of fire tore through the dry pastureland above his home. With a 100-gallon tank and garden hose, he sprayed the flames just feet away, advancing when he could and retreating when the flames became too hot. “We had water and we had friends,” he said. “This was in Stage 3 evacuation, and everyone was still here: fire trucks, tractors, plows.” For hours, they beat back the fire. In the end, it burned around the property in every direction, but the houses and barns were untouched. This summer has seen more than 2 million acres burn across the West; in less than a month, more than 100,000 acres burned in Wasco County alone. And the costs of fighting those flames are high: Six firefighters have died fighting record blazes in California, while near Dufur, a man lost his life defending his neighbor’s home. Here on the dry flank of the Cascades, outside help can be slow to arrive. Even when it does, residents often choose to stay to protect their homes, harvests and heritage, doing so without hesitation. This summer’s fires, however, have tested their mettle and challenged their ability to safely fight the blazes. WHEN NANCY GIBSON HEARD the South Valley Fire was moving toward her and her sons’ homes, she drove into the evacuation zone with her daughters-in-law. As both sides of the road burned and the smoke thickened, they rushed into their houses to save what they could from the growing flames. “We weren’t even supposed to be there and we were there, grabbing animals and taking pictures off the wall,” she said. “Everything was just black. You could smell and just feel it coming.” By the time they’d left, they’d grabbed two horses, two goats, a calf, a guinea pig and a cat. “I’ve lived here 30 years and we’ve fought wheat fires before, but never one after another like this,” said Gibson. 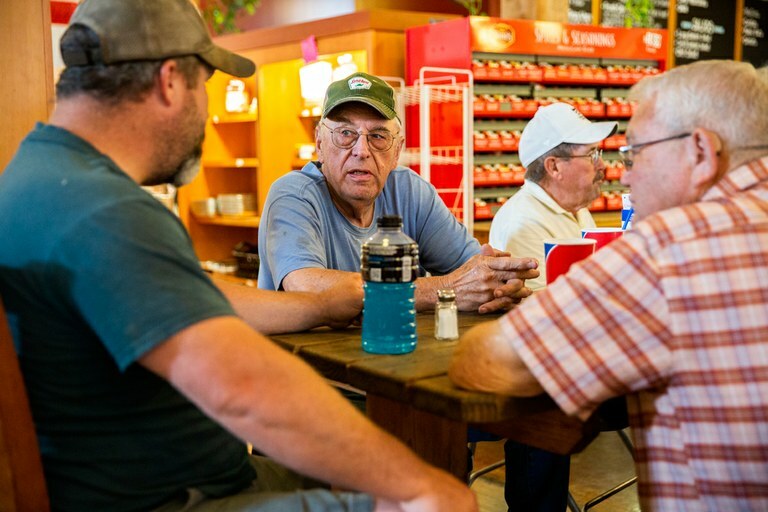 Farmer Ed Underhill, center, talks with his neighbors at Kramer’s Market in downtown Dufur, Oregon, Aug. 8. Underhill and his neighbors were among the first to respond to the South Valley Fire after it ignited near here Aug. 1. Since Europeans colonized Dufur in the mid-19th century, wheat fields have spread across its undulating dry hills. Today, they span nearly 60,000 acres in Wasco County, and much of the land that isn’t wheat is dry grass by midsummer. The tractors and combines used to tend fields and harvest inevitably kick up sparks, starting small fires. With spray equipment mounted in the back of pickup trucks, farmers can typically douse the flames without needing to call fire crews. And when fires get big, they call friends and fellow farmers, who drive along the spreading fire in a line of pickup trucks, spraying it at close range. But a dry winter followed by a hard summer of high temperatures, no rain and gusting winds has pushed Dufur’s bucket brigade to the max. Still, few in Dufur question the necessity of facing the flames. “We’re going to protect our own stuff before anyone else gets here,” said Miller, who’s fought alongside the farmers at each of the major fires. Just how safe — and legal — it is for individuals to fight fires on the land they depend on has been a contentious issue in rural Oregon. Unlike trained firefighters, who follow a chain of command and are taught to value their safety first, locals are more likely to advance on the flames than set up defensible perimeters. They can also get there within minutes, while professional firefighters and air support can take hours to arrive. At times, tempers flare between the groups. Locals get frustrated watching as fully equipped rigs stand by waiting for orders or hold a far-off fire line as fires burn through fields and pasture. On the other hand, freewheeling locals who attack fires aggressively can put themselves, and the firefighters, in grave danger. For example, during the South Valley Fire, firefighters set up a fire line along a road that separated a burning field from an unburnt one. Without asking permission and ignoring calls for patience from firefighters, a local jumped ahead of the defensive line and started a back burn when the winds died down. The back burn stopped the fire from spreading across the road. But if the wind had kicked up or the fire had blown up, the costs could have been dire. A couple hundred miles southeast of Dufur in Harney County, a back burn set by ranchers Dwight and Steven Hammond trapped firefighters near an active burn and forced them to evacuate with the assistance of a helicopter. The Hammonds were prosecuted and eventually jailed for setting that fire and others. In response, militants who sympathized with their plight occupied the Malheur National Wildlife Refuge in 2016, sparking a month-long showdown with federal law enforcement. A relative who helped start the blaze said his grandfather and uncle set it as an attempt to cover up illegal poaching, though supporters say it was a necessary land-management tool. IN DUFUR, FIREFIGHTERS RECOGNIZE the urgency locals feel, said Tom Fields, a public information officer for the Oregon Department of Forestry assigned to the South Valley Fire. “We are concerned for their safety,” Fields said, “but we do understand that that’s their home and livelihood and that they’re doing all they can to protect it.” He said that their team leans on locals for their knowledge of the area and quick access to heavy machinery. “We want to bring them in because they know their property,” Fields said, including information about water availability, access points and local wind behavior. This season, locals and firefighters have worked together more closely, driven by the intensity of the fires and the locals’ ability to respond quickly. Jack Frakes Jr., chief of the Dufur volunteer fire department, poses for a portrait in the fire station in Dufur. Jack Frakes, the chief of the Dufur Volunteer Fire Department, was one of the first trained firefighters to arrive at the South Valley Fire, about 15 minutes after it blew up. Local volunteer firefighters can get to the fires within minutes, but professional firefighters who get dispatched from about 15 miles away take about 45 minutes to arrive. When he arrived, about a dozen farmers were fighting the fire. Locals’ quick response helped minimize the damage from the South Valley Fire, Frakes said. “The only way to do this is working together, shoulder to shoulder.” Cody Masterson, a local mechanic who helped fight the fires, said firefighters and locals developed a division of labor as the fires burned. “The firefighters go into the woods and let the farmers take care of the wheat,” said the local mechanic. 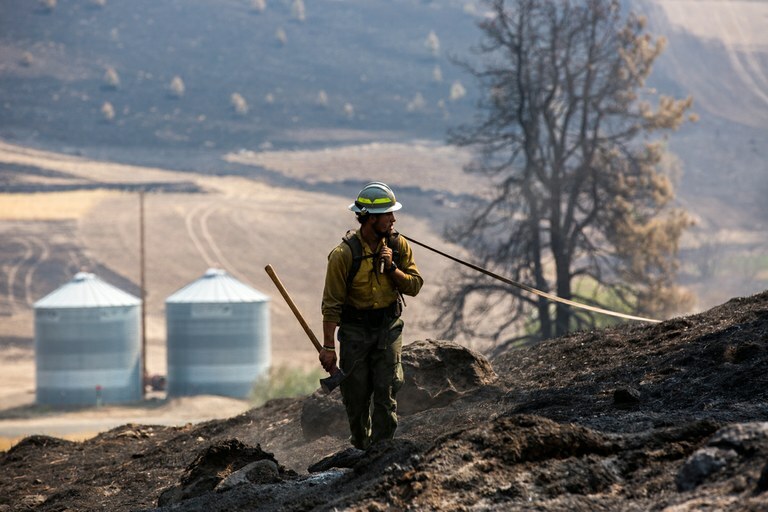 A firefighter with the Oregon Department of Forestry extinguishes hot spots from the South Valley Fire Aug. 8 near Dufur, Oregon. As the fire abated and fire crews mopped up hot spots, the town sought to return to some sense of normalcy. But the fear of rekindled flames will linger until rain comes. In town, farmers wondered if they could safely harvest their fields, worried they might accidentally throw up a spark and be forced to become firefighters again. Some questioned whether newer no-till farming methods raised the danger of fire. Even during good years, wheat farming is a tough way to make a living, but the fires this summer, combined with disruptions in the wheat market from President Donald Trump’s trade wars, are stretching farmers thin.